Be the first to share your favorite memory, photo or story of Loah. This memorial page is dedicated for family, friends and future generations to celebrate the life of their loved one. 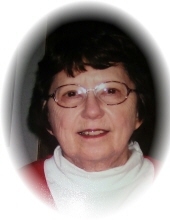 Private family memorial services for Loah A. Hawhee, age 87, of Bedford, Iowa, will be held at a later date. Memorials may be directed to the Villisca Good Samaritan Center, 202 Central Ave. Villisca, Iowa 50864. Arrangements for Mrs. Hawhee were entrusted to Cummings Family Funeral Home. Memories and condolences may be shared with the family at www.cummingsfamilyfuneralhome.com under Obituaries. Loah (John) Rucker Hawhee was born February 2, 1932 to Charley John and Cornelia (Dickson) John in Bedford, Iowa and entered into rest March 25, 2019 at Villisca Good Samaritan Center, Villisca, Iowa. She was raised on the family farm at Bedford, Iowa and was member of the Berea Church of Christ, near her family farm. On February 14, 1949 she married her sweetheart, Robert Allie Rucker. To this union four children were born. Together Loah and Robert farmed in the Bedford, New Market and Villisca areas until Robert's death in 1982. Following his death she moved to her home in Bedford and worked various places in the Bedford and Clarinda area. Loah was the best cookie and noodle maker any grandchild could ask for. Loah had a deep love for fishing which she passed on to her son, Denny and several of her grandchildren. She always had time to take a child fishing. Loah was preceded in death by her husband, Robert, parents, son-in-law, Larry Neal and 9 siblings. Loah is survived by her children; Connie Neal, Clarinda, Iowa, Dennis (Melissa) Rucker, Cedar Rapids, Iowa, and Jill (Don) Case, Villisca, Iowa; 13 grandchildren; 17 great-grandchildren; brother, Rex John, Wichita Falls, Texas; sister-in-laws, Jan (Lowell) Sunderman, Bedford, Iowa, Mary (Oliver) Mothershead, Leon, Iowa and Dorothy Rucker, Bedford, Iowa along with many nieces, nephews, family and friends. "Email Address" would like to share the life celebration of Loah Hawhee. Click on the "link" to go to share a favorite memory or leave a condolence message for the family.